Facet syndrome causes pain and stiffness. Each section of your spine houses three joints. These consists of 2 facet joints in the rear and one disc in the front. This complex grants you stability and supports the weight of everything above it. It also allows your range of motion and movement. Pain and inflammation of the facet joint is facet syndrome. The symptoms of facet syndrome can range, but the most common are pain, stiffness, and soreness. Pain is due to inflammation of the surrounding tissue. The level of pain can vary but is most severe during long periods of inactivity. This includes when sitting or standing for extended periods. Changing your position can provide temporary, minor relief. But any inactivity, including sleeping, can cause tremendous pain. Causes include wear and tear of the tendon over time, usually due to overuse or aging. Repetitive motions in sports may lead to tendon pain. This includes tennis, swimming, golfing, basketball, baseball, and running. What are the treatments for facet syndrome? Treatment depends on the type and severity of your injury. Physical therapy or rehabilitation may be the best solution. It can reduce pain and restore the normal range of motion and strength of the affected tendon. Sports injury treatment can also help you avoid further damage and speed regeneration. There are many different sports medicine treatments available for facet syndrome. The particular treatment you will need will depend on your individual case. If you’re experiencing pain from sports injuries or any of the symptoms listed above, make an appointment with our sports medicine doctor at Spinal Rehab Sports Medicine today. 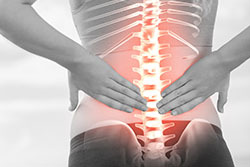 Dr. Bob Meyer will diagnose the cause of your pain and create a custom treatment plan just for you.